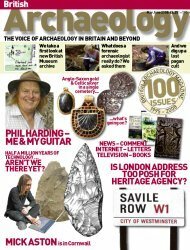 Today I got my copy of British Archaeology (May/June 2008) in the mail. On p.30-37 there was a wonderful, detailed article, “The Lost Royal cult of Street House Yorkshire,” on the finds at Street House Farm, near Saltburn, North Yorkshire, the ‘possible cult centre’ graves with the fabulous jewellery. Everything is now beginning to make sense. However, reading this article hot on the heels of the one in Discovery News makes me even more disgusted with the ‘reporting’ in the latter. In British Archaeology, Stephen J. Sherlock and Mark Simmons explain carefully the reasoning behind the possible Christian repurposing of the iron age coin (basically, the coin had a sort of cross-like pattern on the reverse, and the piercing of the coin meant that it would hang with that cross properly oriented). They also make clear the timeline of the inhumation: probably while Hild was founding Whitby. Given that this site is only about ten miles from Whitby, my connect-the-dots fictional engine has been working overtime. I’ve decided who the powerful, high-status woman in that grave was and why she was there. I know why her jewellery and that of her cohorts is such a mix of Angle and Merovingian and Iron Age. And I’m having a marvellous time inventing it all. I’ll do another, longer post on all that another time (when it’s all set and sorted and written). For now I’ll stick to the reportage aspect of all this: I only got to this thrilling (to me) new fictional place because the journalism in British Archaeology was honest, it made sense, it didn’t contradict what is known to be known. Unlike that piece of rubbish in Discovery News. Tuh.